The setting in itself is quite poetic: a frigid, snowy morning at an independent coffee house in Grand Rapids. 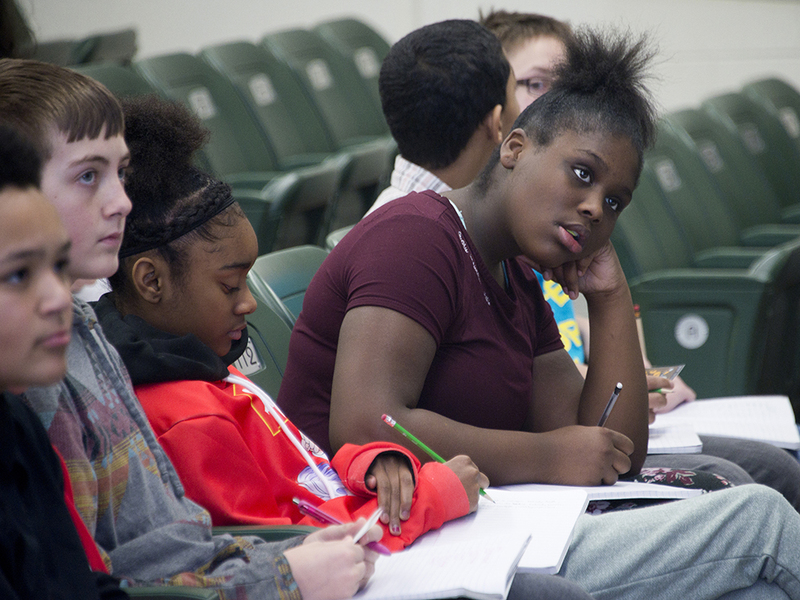 Marcel “Fable” Price, or Fable the Poet, as he is known in the Grand Rapids poetry scene, tells his story as a socially conscious writer who never dreamed he would love teaching his craft to middle and high school students. But that’s what he does, with a band of fellow spoken-word poets that make up The Diatribe. In many Kent County schools he introduces his rhythmic, snappy, tumbling poetry to preteens and teenagers, and then challenges them to write their own. What results is often quite remarkable. Students dig deep, and even the coolest, most seemingly together teens reveal their inner thoughts and struggles. Free-flow verses address strong topics, themes and statements. Many students stand up and present their poems to peers, and a sea of support unfailingly rises around them. One student even shared her story with National Public Radio. 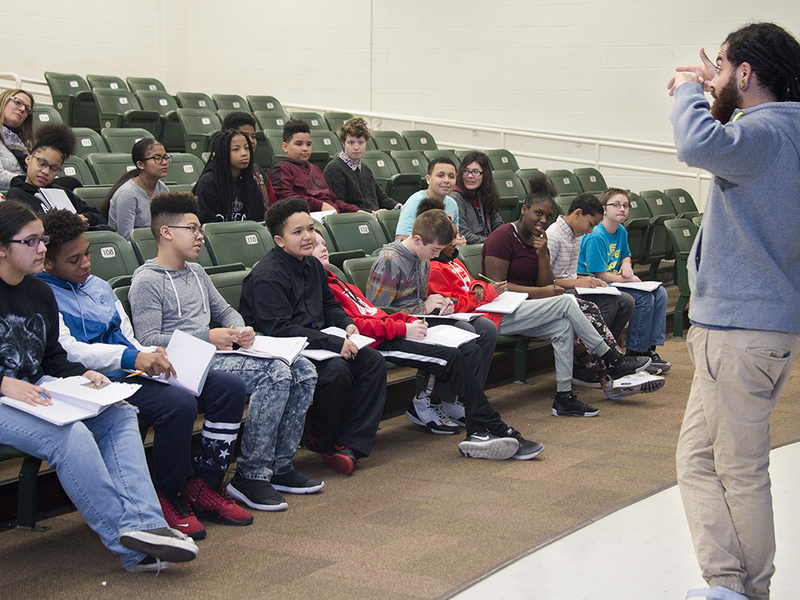 The Diatribe has presented assemblies, workshops and poetry slams in many public schools, including Kelloggsville, Grandville, Northview, Comstock Park. Caledonia, Byron Center, Godwin Heights, Kentwood, Wyoming, East Grand Rapids, Kent City and Grand Rapids. Mainstay members include Fable, Rachel Gleason and Foster G. Foster II, who are often joined by other poets. Not only is Price a founding member of the Diatribe, he’s Grand Rapids Poet Laureate, working to connect people with mental health resources and address issues affecting the community. 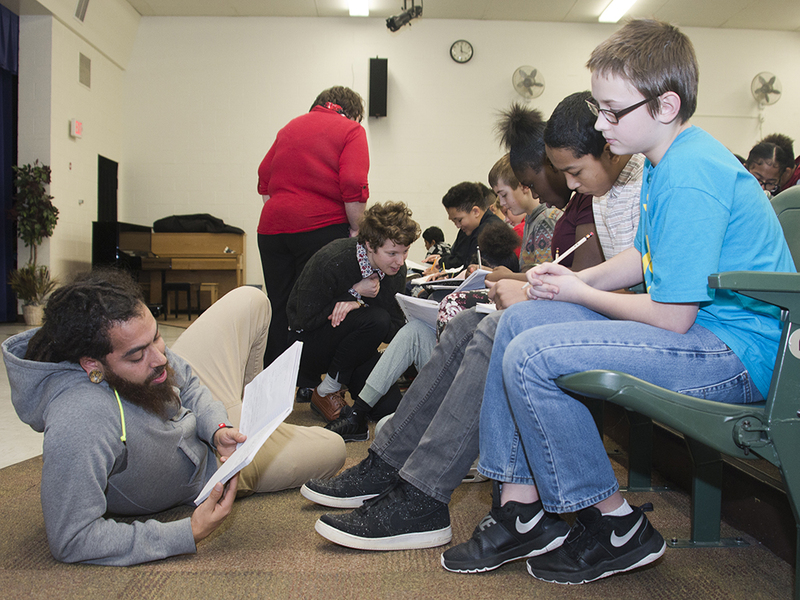 “Poetry has always been my safe place, a place where I could talk about what I had been through or look back at where I have come from, but I didn’t think I would fall in love with teaching so much,” Price said. 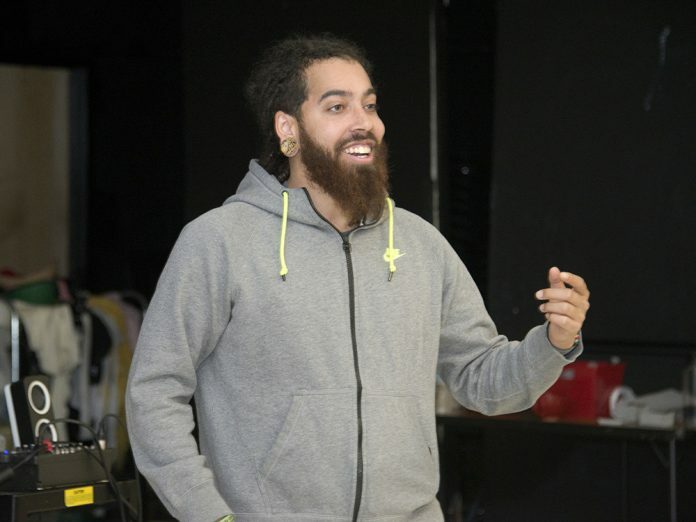 “I love being a teaching artist. I love interacting with these kids. I love teaching them and I love learning from them. With his long hair tucked into a black cap and his ear lobes stretched wide by gauges, Price shares his experience as a struggling high school student who was inspired by an English teacher who told him he could be a writer. “It was because of that phenomenal educator who believed in me and pushed me – that’s the whole reason I write,” Price said. That year, he read his writing in a school talent show, stunning his classmates. That initial boost has grown into a mission to use poetry to educate, unite and spread awareness. 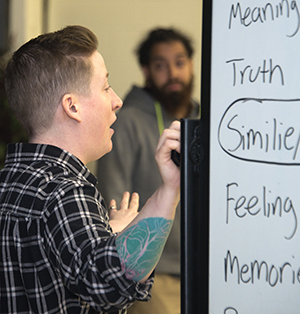 Price, 29, is now education-savvy enough to talk to educators about teaching methodologies used by The Diatribe, offering literature, videos, and other resources. He is working to create a fundraising committee to help schools pay for The Diatribe’s programs. Last April, Price was named the Poet Laureate for a three-year term. He is the author of “Adrift in a Sea of M&Ms,” a book of poetry on race and mental health issues, and he is working on a second book. 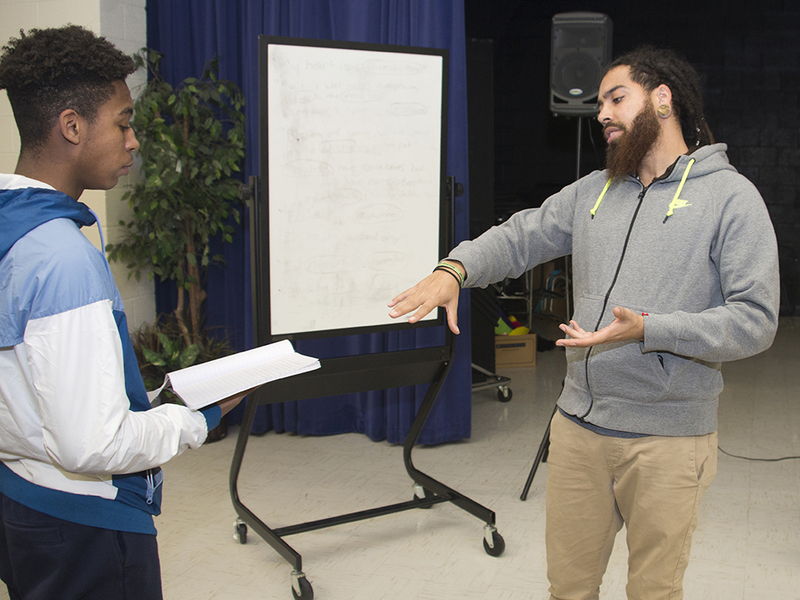 As Poet Laureate, his goal is to address community mental health needs. 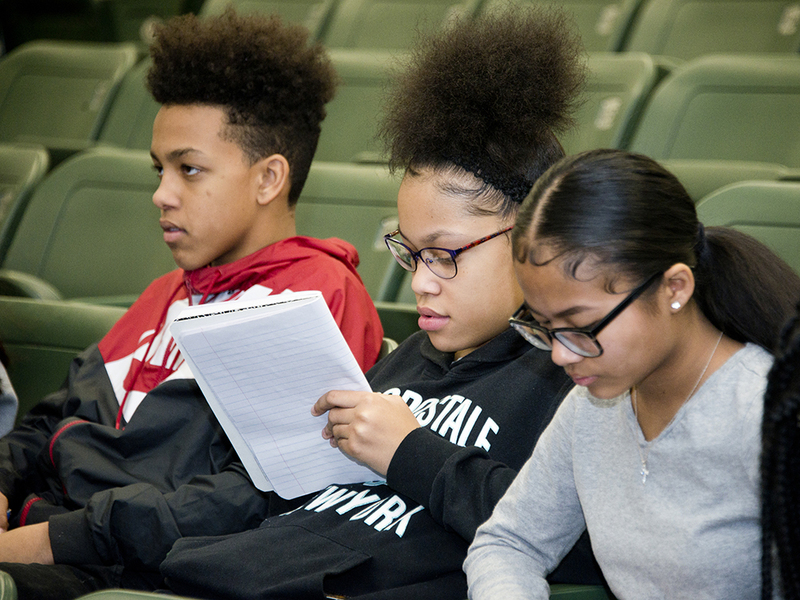 The Diatribe poets’ own writing delves deep into topics many people, especially teens, aren’t often willing to talk about or consider taboo: identity including race, sexual orientation and gender-role expectations; experiences of abuse and violence; instability; mental health issues; grief and deep love for family. 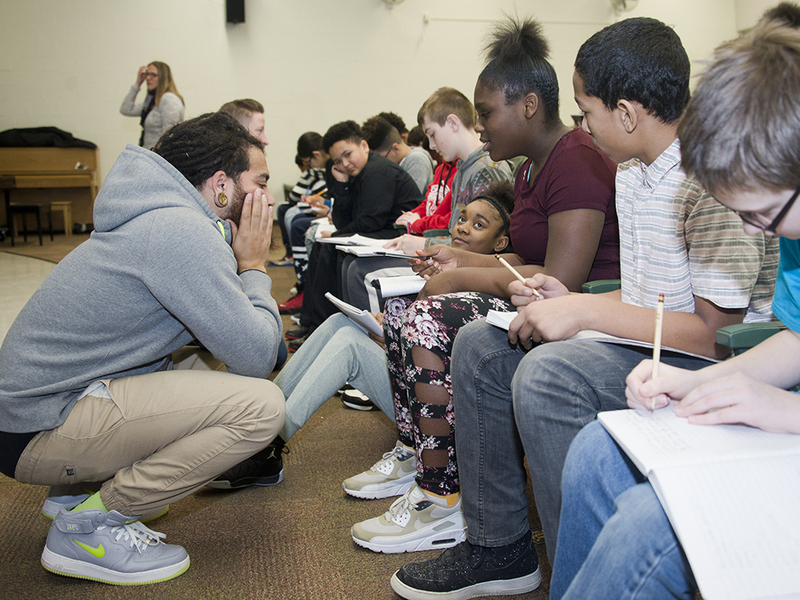 The poets find there is something that resonates with every student. “You always connect to what you relate with, and if you have the courage to talk about something others will too,” Price said. Rachel Gleason, his fellow Diatribe poet, sees those connections at the schools she visits with Price. 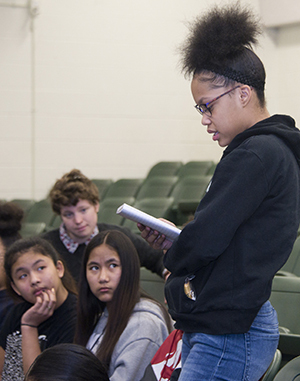 Recently, at a middle school poetry reading, 50 students stood up to read their poems. One boy revealed that he had been sexually abused. “To see his peers stand up and clap for him, run up, hug him and lift him up, that’s changing the culture of a school,” Price said. 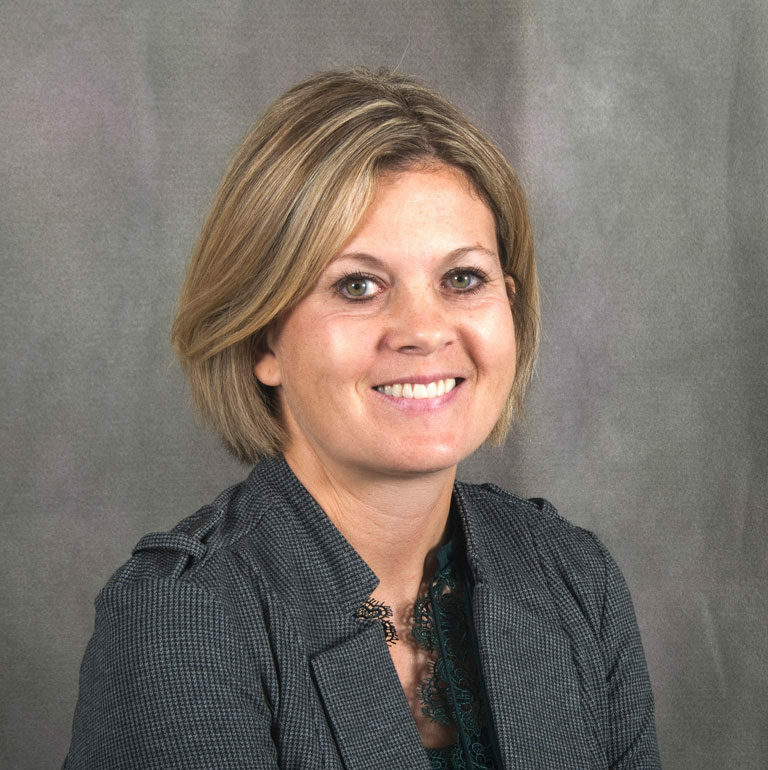 Kelloggsville High School English teacher Jennifer Sadler was one of the first teachers to invite The Diatribe to her classroom. She said Price’s impact has been huge. Because Price is open about his struggles, students feel safe to talk about theirs too, whether at school or home, she added. Price has worked in graphic design for FedEx, at Best Buy, at shoe stores and other odd jobs to get by while developing his poetry. (“I love shoes and technology.”) Now he’s a full-time poet. 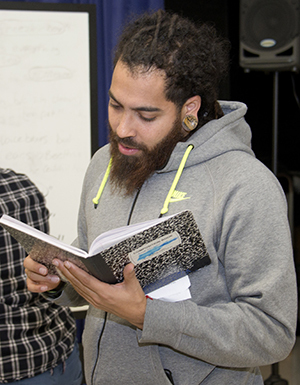 He uses his poetry as activism, touching on topics that affect the students he teaches: mental health, gentrification, race, trauma, identity, the way boys are raised. Price realizes how deeply art and creativity can shape a person’s path. It was at ArtPrize, the city’s annual art competition, in which The Diatribe created the contest’s first blind and deaf-friendly piece several years ago, that Price started his unlikely trajectory into teaching in middle and high school classrooms. 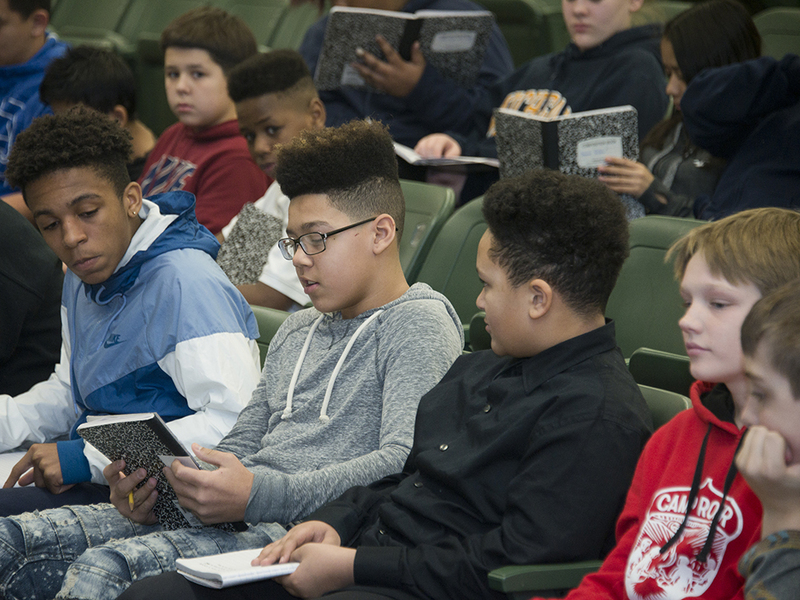 From there, they created a syllabus and streamlined their focus into assemblies, workshops and after-school programming. 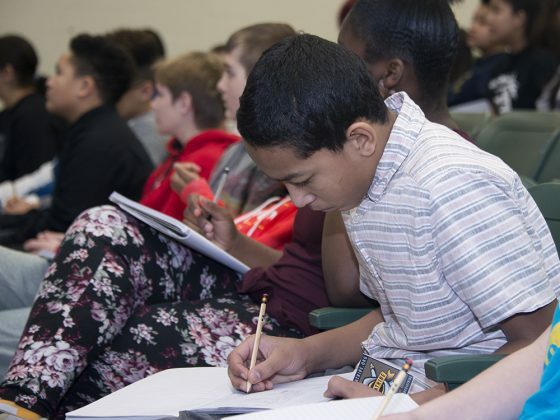 They typically perform an all-school assembly and then offer a six-to 12-week session of workshops. They partner with organizations including Kent District Library. As Poet Laureate, Price is using poetry as a catalyst to encourage people to reach out for help. He organized a mental health awareness event attended by 200 to 300 people at Grand Rapids Public Library, which included poetry, storytelling and resources such as Pine Rest Christian Mental Health Services and the Mental Health Foundation of West Michigan. He’s learned from being in schools things he never knew before, like how many students are in foster care. 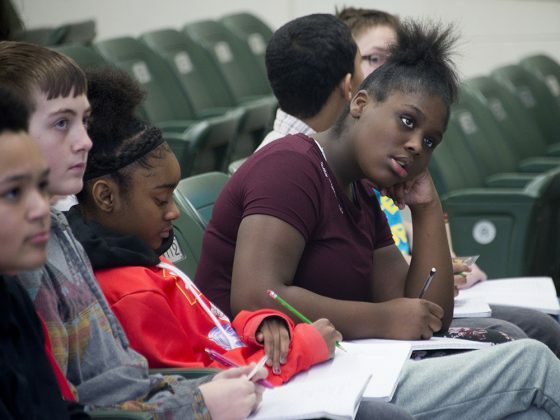 He’s gotten involved with West Michigan Fair Housing to get students to talk about gentrification, how their communities are changing around them and informing them of how housing affects their education. Using poetry as expression is one thing but using it to arm and equip people to improve their lives is another, he said. “I want to bring a lot of focus to poetry in Grand Rapids and get more people active in the poetry scene than ever before,” Price said. Adding unique color to that scene, a lyrical landscape both scarred and beautiful, are the voices of youth given a microphone by Fable the Poet.